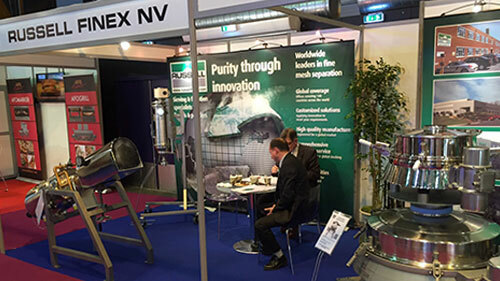 Russell Finex look back at their participation in CFIA in Rennes, France last month. The show was definitely a success with 1,300 exhibitors and welcoming 17,046 visitors. The majority of exhibitors presented process equipment, making the fair the largest food manufacturing platform in France. According to the organization most of the key associations and institutions of the food industry were present, which acknowledges the importance of the show. Besides providing a platform for both food manufacturers and industrial equipment suppliers, CFIA also launched a job event for the first time. The job networking event aimed to attract young talent to the food industry, where students could meet the key manufacturers of this fast moving industry. CFIA was the ideal place to be acquainted with the latest manufacturing trends in the food industry. At the show Russell Finex were proud to present their latest innovations in separation equipment. The Liquid Solid Separator™ is a high capacity rotary centrifugal separator which removes solids from liquids or slurries. This multi-purpose liquid-solid separator attracted a lot of attention being suited both for processing food products or effluent streams. This machine has a small footprint and can reach a high throughput even when separating viscose slurries like curd and whey and distillers mash. Another must see on the stand was the Russell Hygiene Filter™, a sanitary liquid filter with a self-cleaning design meeting the hygienic standards of the food industry. On the stand a cut out version of the Russell Hygiene Filter™ was shown enabling visitors to see the self-cleaning wiper system within the filter element. The Russell Hygiene Filter™ is ideal for filtering viscose food liquids such as caramel, honey or chocolate. Russell Finex also exhibited the Russell Compact Sieve®, a reliable vibratory screener which has been used for many food applications. Two different finishes and sizes of the Russell Compact Sieve® were on display, showing a few of the many customized possibilities. Food powders like infant food, milk powder and flour are often screened by the Russell Compact Sieve® to eliminate any contamination and ensure product quality. Next year the CFIA will take from place 8th - 10th of March and Russell Finex will again participate in this important food processing show. In the meantime if you want to learn more about Russell Finex’s products and their applications you can visit the products page or food video section. If you require a separation solution for your food products, feel free to contact Russell Finex and see how they can help you. Their extended experience within the food industry and innovative customizable separation equipment will provide you the screening solution meeting your exact requirements.